Indoor facilities: Kitchen: Cooking stove,Hot plate,Oven,Microwave,Fridge freezer,Freezer,Coffee maker,Kettle,Dish washer,Toaster. Set in the perfect location. On a residential chalet estate with plentiful trees, it is a very pleasant place to spend Spring or Autumn because of the mild climate. The local beach can be enjoyed throughout the year. Restaurants with Mediterranean food at good prices. Fully equipped kitchen. The living-room includes a fireplace, a hot-air heating system, TV, DVD and a HIFI system. The porch has been enclosed and is a nice spot to enjoy the local greenery. A great terrace at back of the house in the gardens. The top floor has a large solarium for sun-bathing or having a barbecue.Near to places of cultural interest, such as Orihuela, the mud spa in Lopagán, the Palmeral and the El Huerto del Cura gardens in Elche, the seafront promenade in Pilar de la Horadada and its spectacular sandy beaches, the cities of Murcia and Cartagena, as well as Torrevieja and its Habaneras shopping centre. Wasn't very clean. Shower broke. No bottom sheets on the beds. Too cluttered. We arrived very late. No welcome pack I.e. water, bread, butter eat..... the terrace, and back yard and porch were very dirty... very dark inside. Yes, you arrived very, very late and you haven't had any extra to wait for you, any pack for you? You have to remember that we aren't a hotel or an agency, You didn’t order a welcome pack that I am aware of . we went very pacient waiting for you (when we do some opinion it is necessary to say everything). The terrace and back yard where not good … We had quite stormy weather that had made a mess … It was cleaned within an hour of Ruth complaining. The shower holder did break ….. It was replaced the same day. I think that the best is to have an answer about the problem, and to solve them, things don't work all the life. I am very sorry Madame, but I think that I answered a lot of doubts you had before your stay, you had answer for each problem you saw. It is a pity if you didn't enjoy your holidays, we try it. La casa está situada en una zona muy tranquila con varios bares y restaurantes a unos 5 minutos andando y un supermercado a 2 minutos en coche. Es amplia y luminosa e ideal si se viaja con mascotas, ya que tiene el porche delantero, una terraza en la parte de arriba y un patio muy acogedor al que se accede por la habitación principal y en las fotos no se ve. Al final de la calle, de camino a la piscina, hay un parque para pasear al perro, y a 10 minutos en coche hay una playa en la que se admiten perros también. La dueña es muy agradable, nos facilitó muchísima información de la zona, atendió nuestras consultas de manera rápida y fue flexible con las horas de entrada y salida. En general, una experiencia muy buena que esperamos poder repetir en el futuro. Me alegro muchísimo que lo hayan pasado bien y que les haya gustado la casa, aunque hayan sido poquitos días. Espero poder contar con ustedes en próximas ocasiones. También han sido ustedes una gran experiencia para mí, por sus consejos y amabilidad. Great location for golfing and walking the dog along the sea front, easy driving to shops. Was a shame that the sun was shaded from the house in January by the other houses and trees behind, as the weather when we were there was lovely. Neighbours were very friendly. The house is very much the families own holiday home, let out as well. Upstairs room is accessed outside the house so wouldn't really be suitable for young children. Dimos con esta casa por casualidad, porque estábamos buscando algo para descansar unos días, después de mucho trabajo. Todo un acierto. Se está como en tu propia casa, no se echa nada en falta. La persona que nos entregó las llaves encantadora, nos explicó todo estupendamente. La piscina es preciosa, aunque hacía un poco de fresco. Casi todos los días fuimos a la playa de Cabo Roig, que está muy resguardada y por las noches a escuchar música al pub irlandés y beber una cervecita. En verano debe ser una pasada estar en esta casa, lástima que yo tengo pocos días. Near to La zenia bouleward and La zenia beach. Bars and restaurants in 7min walkdistance. Should have installed aircondition downstairs and upststairs because the fans in the roofs dont cool down so its always very hot everywhere:/. Apartments/areas poolplace was under rebuilding so we was offered alternative poolplace and got a little refund back because of this. Had we known this in the beginning of the refund agreement we would consider asking for a bigger refund. I stort sätt bra men för mycket möbler gjorde det trångt. För långt till poolen, ca 1000m! Ya siento que está familia considerara que había demasiados muebles. La casa está preparada para vivir, par sentirse confortable, no de batalla como suelen estar las casas alquiladas. Hasta ahora nuestros inquilinos es lo que habían sentido por eso nos entristece que lo hayan visto así. The house is very comfortable. There are two floors, the ground floor with two bedrooms, one with a double bed and another one with two twin beds, a bathroom, the living-room and the dining-room and the kitchen fully equipped (a washing-machine, washerdishes, combi fridge-freezer, toaster, electric kettle, juicer, coffee-machine, microwave, vacuum cleaner and all the necessary utensils). The living-room includes a fireplace, a hot-air heating system, TV, DVD and a HIFI system. The porch has been enclosed and is a nice spot to enjoy the local greenery. A great terrace at the back of the house. The top floor has a large solarium for sun-bathing or having a barbecue, with a bedroom with two beds and a bathroom. 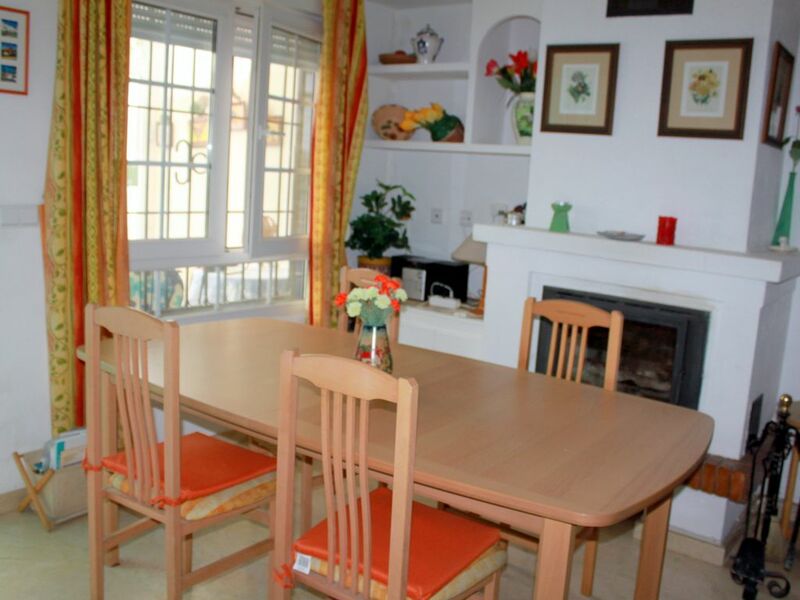 The bungalow is in Villamartin Urb., it is in calm and with a lot of trees. Las estancias largas tienen un precio especial y también depende el precio del número de personas.